Arriving at the club, this would be a lesson of many firsts…. Finally allowed to leave the circuit, this would be my first lesson not flying in a rectangle for a loooong time, I can’t remember being above 1000ft without being told “watch your height…”. 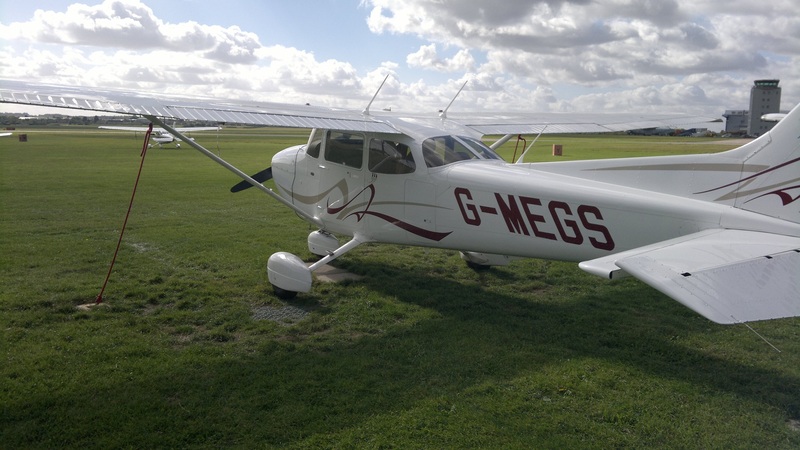 My instructor for the day was still out flying somewhere, so I was told to go and check out the plane, I’d be flying MEGS…….. Pardon me? I could have sworn you said MEGS and must have misheard you……You’ll be flying G-MEGS. They realise I’ve never flown MEGS before right? Better check……Nope still flying it. Ok then, G-MEGS it is. So why the fuss about the plane, it’s a C172, so what’s the issue? 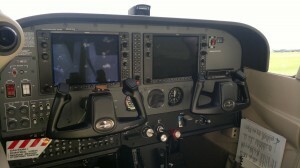 It’s a C172 with a Garmin 1000 glass cockpit. All the bells, whistles, buttons and switches you could ever wish for appear in G-MEGS. It was an option half way through learning circuits and an instructor thought better of it as there was enough to be learning without a whole new set of switches and lights. So believe it or not, of the clubs 4 Cessna’s, I’ve never got to fly this one before. Don’t get me wrong though, I’ve often walked past it wanting to one day have a go. All those extra switches and lights require a different checklist, it’s fundamentally your standard C172 checklist, but now you have to check the G1000 isn’t detecting faults and dials now appear on the screen etc. There are a couple of other buttons to press and as you can see below the yoke in the picture, there’s a million circuit breakers! Having had the slowest checkout of my life, with moments of “Where the heck is that..?” I finally returned to the club house to catchup with my instructor and confirm we were going flying somewhere other than laps of the airport. We were, Yaaay!! The plan was to fly out, make a right turn, find “point Alpha” (a good reference starting point for bigger navigation sessions), do some radio work, request a QDM etc. and come back for an overhead join. 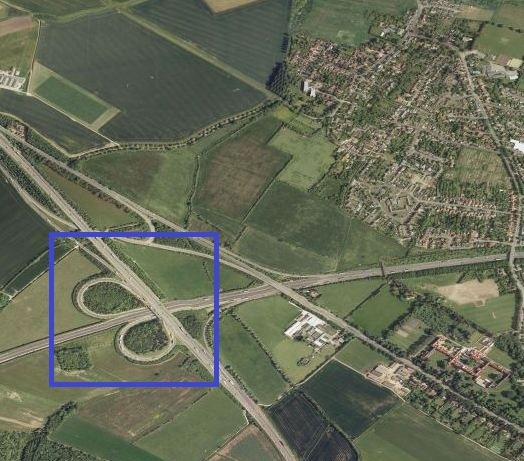 Then it would be a touch and go, a left hand climbing turn out and then off to “Six Mile Bottom” (it’s a small village East of the airport and has a good railway crossing a road landmark). I forget what the actual wind was on the day, but if this had been a circuit lesson it would have been cancelled (greater than 10 Knots crosswind). As the objective of this lesson was not about me landing, worst case the instructor could always do it, so the lesson remained on. During the power checks another student, who from the radio calls had just been released solo, discovered the wind was to much and ATC called him back. The digital RPM on the G1000 makes you faff with the throttle, 1722 RPM, but I want 1800….. that sort of thing. The crosswind was so high that I asked the instructor “I think I’m doing this take-off….” during take-off brief. A reminder to turn ailerons into wind and level them before rotation, but other than that yeah I could have a go. Other than the crosswind that made for a semi-straight run, the take-off was ok. 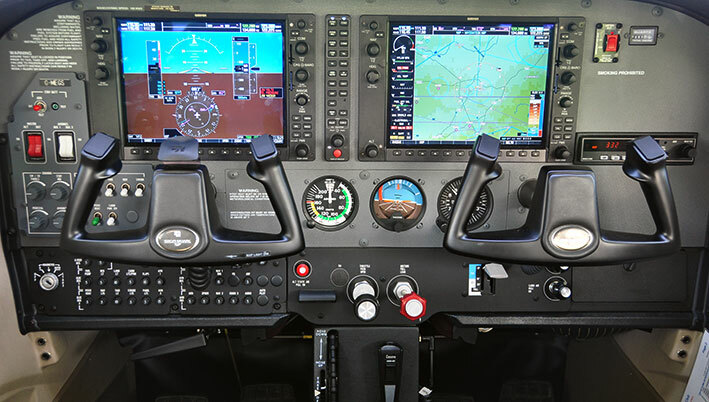 The G1000 continued to have a “new toy” effect on me, rather than glancing at a gauge that is ballpark “80knots”, the digital airspeed just appeared to be all over the place, 72, 80, 84, 76, 80, 74, 81……. I had a flash back to a previous lesson where the instructor said “You know what an 80 knot climb looks like…..so look out of the window and fly what looks like 80 knots!” To that end I gave up on the digital display, looked up and started flying properly again. It’s just basic maths, but it still surprises me how quick by plane you can be over a “nearby” landmark, which by car would have taken a lot longer to reach. Such was the case with point alpha, I’d climbed up to 2000ft, turned right and within a matter of minutes (it felt like a handful of seconds), my instructor was asking “So let me know when you can see point alpha….” Looking down and to my left, it seemed to already be there. This is some sort of trick question, I’m going to point it out and then get told “ahhh everyone says that, but notice how….” Nope, it really was point alpha – my god we reached that quick. The repetition is to allow the station being called sufficient time to get a fix. They then reply with a bearing and a class of its accuracy, with “Class A” being +/-2 degrees. Every radio call I was making was having me think twice as hard as normal, the new aircraft call sign: Golf Mike Echo Golf Sierra, kept making me think “remember what plane you’re in”. I guess I’ve flown Whiskey Kilo too much. With that done, we set the heading bug and then went on to have a play around with compass errors. To demonstrate how awful a compass is in a turn my instructor covered up the Garmin with his map (I’m used to flying with a map covering my instruments). There was traffic in the area so ATC told us not to go above 3,000ft, we were at 2,200ft and if I’m honest my altitude keeping was a bit all over the show (+/-200ft), but I’m gonna blame the wind and the Garmin 1000 vertical speed tape that just seemed to be all over the place half the time. Suffice to say the compass was once again verified to be rubbish in a turn, no awards for discovery there, but always nice to have a practical to prove it. Radio calls done to indicate we had the airfield insight it was time to rejoin the circuit, flying over the 05 numbers at 2,000ft and then turning back to cross the runway before making a descending turn – taking all the power off to get it down to a thousand feet. Crossing 05, my altitude dipped to 930ft……I’d been flying nothing but a 1000ft for almost as long as I can remember, but suddenly with just 20 minutes up at 2,300ft, now everything felt really low. It was a lot like driving at 70 mph and then pulling off into a 20 mph zone, feeling like you could just stop, get out and walk faster……..Now I almost felt like we were low enough to hit something, a double take that we were at 1000ft again. Normal circuit stuff. Such was the crosswind on final we were flying in with the nose 45 degrees off from the runway, and such was my concentration on attempting to make a decent show of the approach that I forgot to radio “final” (400m out my instructor asked if I was going to…….arrgh). If there’s one thing I’ve found in flying, it’s the ability for the mind to zone in on 1 task and forget everything else, it’s almost scary how focused you can become to the defeat of all else. Don’t know why I bothered concentrating though, the last 50ft were awful and some instructor assistance was required to get it down with grace. Crosswind landings have got to be a motor memory thing, I’m not reacting to the inputs quickly enough, there’s a reaction but because everything is reactive, the reaction and the amount of input needs to be instinctive…….and well, it clearly isn’t instinctive enough yet. 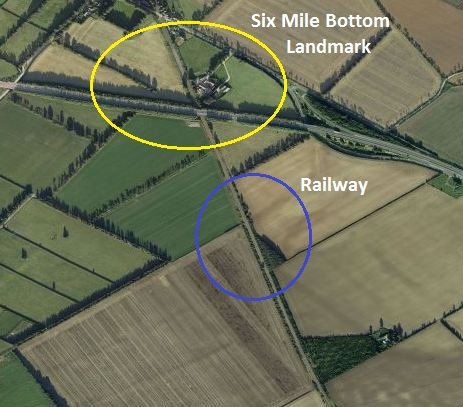 Navigation to Six Mile Bottom: That’s a railway line? As we climbed up my instructor told me to follow the railway line, my thoughts were “Ok I reckon that must be the train track…….but it must be one narrow train!” I hope it looks wider on the ground, because it almost looked like a public footpath from the sky. Again, no sooner was I convinced it was a railway line, the landmark I was looking for (road crossing the railway line) was insight – but self doubt kept playing in my mind such that I hadn’t gone “Yay there it is…..” And we were over it moments later. To try and put this distance thing into perspective, as the crow flies from the end of the runway to the yellow highlighted circle of Six Mile Bottom, it’s exactly 6 miles. At 100 knots, subject to wind affecting ground speed, you’ll cover this distance in ~3 minutes. However, you’re 2000ft up, a quick bit of crude math suggests that from 2000ft, if you look down with an angle of 10 degrees (or 80 from the planes perspective), you will be able to see a point 11,500ft away (2.1 miles). Make that angle 5 degrees and it will be theoretically in immediate sight. Just to get a bit of practice in, time to request a true bearing (also known as a QTE) from Cambridge. This simply gives you the true bearing of the plane from the airport/station. If you then fly the reciprocal of the bearing given, you’ll be heading to the station. All done exactly as a QDM, but although it’s known as a QTE, the call is still for a “True Bearing”. Calling ATC to tell them we had the airfield insight and request an overhead join, it was time to head home. We were told to report when “overhead” (2000ft and over the top of the airport). All that being said, after months and months of going round in circles, this was an enjoyable lesson. Finally have all four Cessna’s in the book, so maybe I’ll get to fly it again from time to time now. This entry was posted on Monday, October 1st, 2012 at 8:15 am by PHC	and is filed under Actual Lessons, PPL Course. You can follow any responses to this entry through the RSS 2.0 feed. You can leave a response, or trackback from your own site.